Michael Laverty has re-signed for Tyco BMW to compete in the MCE British Superbike Championship in 2016. Michael Laverty believes he can build on his end-of-season promise to throw down a serious challenge for the MCE British Superbike Championship in 2016 after re-signing with Northern Ireland’s Tyco BMW team for a second year. Laverty is joined in the Moneymore outfit by Christian Iddon, who takes over from Tommy Bridewell on the factory-backed S1000RR, with the English rider joining forces with Ryuichi Kiyonari in the Bennetts Suzuki team for next season. 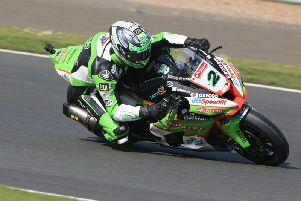 Experienced Ulsterman Laverty finished fourth in the series this year on his return to BSB after two years competing in MotoGP, ending the season on a high with his first victory in the final race at Brands Hatch as he secured four podiums in the final six races. “I am delighted to be back aboard the Tyco BMW for the 2016 season. The continuity of the same bike and team is something I’m really excited about, given the terrific progress we made towards the latter part of this season,” Laverty said. “We went out with a win in the final race of 2015 in BSB and that signals our intention going into the New Year. Meanwhile, new signing Iddon is an exciting addition to the team who brings plenty of untapped potential to Philip Neill’s line-up and the Stockport rider can’t wait to get started. “I’m mega excited to be joining the Tyco BMW team, who for me have so much experience and kudos in the BSB paddock,” Iddon said. Yorkshireman Ian Hutchinson will compete at the international road races next year for Tyco BMW and will also contest the National Superstock 1000 Championship, taking over from Alastair Seeley, who has been linked with a BSB ride in Lee Hardy’s RAF Reserves BMW team. TAS Racing has also confirmed that Guy Martin will remain with the team and will play a ‘significant role’ in 2016, although his racing schedule is yet to be confirmed.